Making it in the Hollywood Star system called for a good deal of luck, but it also required a no small measure of determination. Quite often, that determination came from the Star's humble origins; once they had a taste of the good life they became willing to endure whatever the studio demanded to avoid failure. Usually, this meant conforming to the studio's and the public's image of the Star. Once in a while, an actor comes along who doesn't need the accolades of the Star system to affirm their success. Katherine Hepburn exemplifies this phenomenon. Katherine's parents were a New England urologist who campaigned to educate the public about venereal disease and a suffragette who worked with Margaret Sanger to promote birth control. In this progressive environment, Kate grew up as a self-confident and athletic tomboy who insisted on being called Jimmy. Her view of the world changed during what was supposed to be a fun visit with friends to Greenwich Village at the age of 14. She innocently went into her dear brother Tom’s room to discover his body hanging by a knotted bedsheet. The family insisted that the death was the result of an experiment gone wrong and not a suicide, but Katherine became distrustful and withdrew from her companions. While attending Bryn Mawr College, Katherine discovered the joy of acting. Since Tom’s death, she had been a poor student, only sliding by with the help of private tutors. She had been in danger of being thrown out of Bryn Mawr after getting caught smoking in her room, but she realized that the only way she would be allowed to work in the school’s plays was if her grades (and behavior) were raised to meet standards. After graduating in 1928, Katherine was determined to succeed as an actress, and travelled to Baltimore in order to join Edwin H. Knopf’s stock company. Knopf was perhaps more impressed with her eagerness than her abilities, and he cast her in his current productions. She got favorable reviews, but the next week was criticized for her shrill voice. A move to New York to study with a voice tutor began a cycle of setbacks and minor successes until she won the lead role in The Warrior’s Husband in 1932. The role called for an aggressive and athletic actress, and Kate was perfect. It also brought her to the attention of RKO talent scouts and director George Cukor. Ms. Hepburn arrived in Hollywood in July of 1932, and stood toe to toe with the well-established John Barrymore in Bill of Divorcement. She was so successful in the early part of her movie career that she won the Academy Award for Best Actress in just her third picture, Morning Glory (1933). Even with success in Hollywood, Katherine still wanted to make a splash on Broadway. She was offered a role in The Lake which she accepted for relatively low pay, but the effort was badly directed and doomed to failure. Hepburn bought her contract out rather than stay with the show. Katherine’s efforts with RKO over the next few years won generally good reviews, but were disappointing at the box office. In fact, theater owners labeled her “box office poison” because her pictures failed to bring in customers. She did make a series of screwball comedies with Cary Grant which are considered classics today but were less than successful at the time of their release. 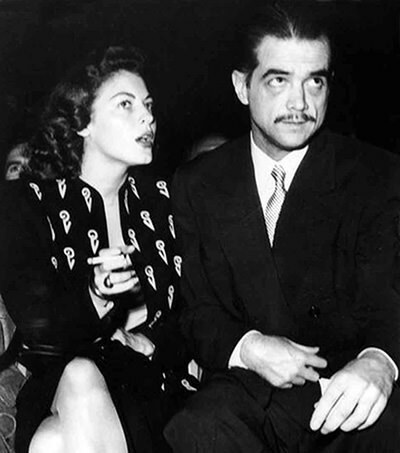 Grant introduced Katherine to his friend, aviation magnate Howard Hughes, and Hughes and Hepburn became a couple from 1936 to 1938. To rebound from her “box office poison” career slump, Katherine began seeking a stage project, and Philip Barry wrote The Philadelphia Story with her in mind. Hughes sensed that the show was going to be a hit, and bought the film rights as a gift for Katherine. The play was in fact a success, and studios began lining up to create a movie version. 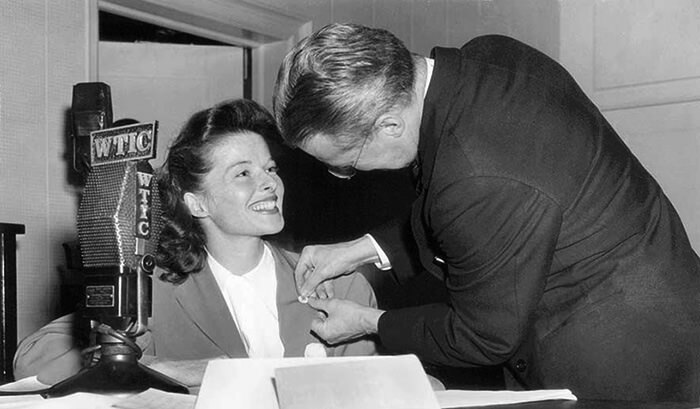 Hepburn eventually cut a deal with MGM with the provision that she would star in the picture and she would have the director of her choice, George Cukor. 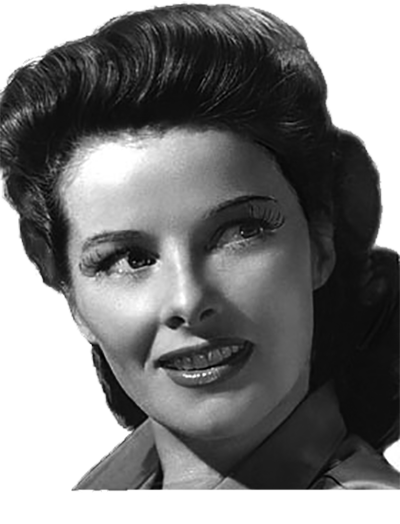 The Philadelphia Story was one of the biggest hits of 1940, and put Kate in position for her next project, Woman of the Year (1942). The film was the first on screen pairing of Hepburn and Spencer Tracy, and lead to a relationship that lasted the rest of Tracy’s life. 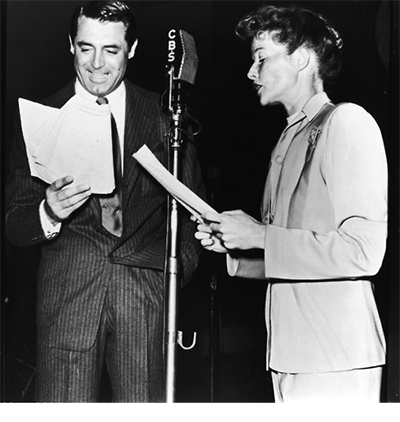 Tracy was married to another woman, although separated, throughout his relationship with Hepburn, but Katherine understood his reasons for not ending the marriage. She was living in Tracy’s house and was with him when he passed away on June 10, 1967, and followed the hearse in her car but chose not to attend the funeral out of respect for the Tracy family. Katherine rapidly returned to work after Tracy’s death as a means to cope with the grief. In many ways it was the golden period of her career, with notable performances in A Lion In Winter (1968), Rooster Cogburn (1975) with John Wayne, and On Golden Pond (1981). Miss Hepburn was fiercely protective of her privacy throughout her life, and had a difficult relationship with the press and studio public relations departments. She had enough of a personal fortune that she could have walked away from acting at any time, but always felt that you were not an actor unless you were actually acting. A cancer was discovered growing on Katherine’s neck in May, 2003. She refused medical intervention, and passed away on June 29. On July 1, 2003, the lights on Broadway were dimmed in her memory. A Star on the Hollywood Walk of Fame at 6284 Hollywood Blvd honors Katherine Hepburn’s contributions to Motion Pictures. 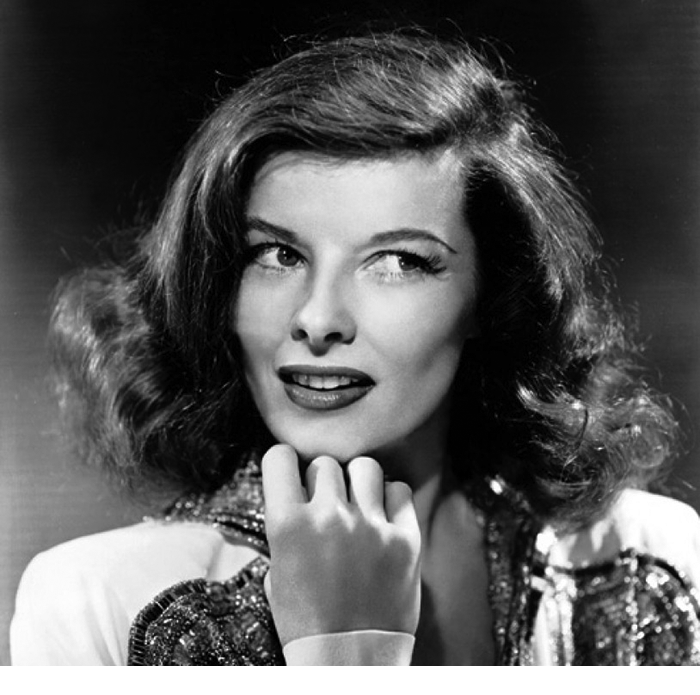 Be the first to comment on "Katharine Hepburn"